If you were given a 10 pound bag of lemons, what would you do with it? We always have a choice…. to make lemonade, cocktails, or even a skin-cleanser. We also have the choice to just throw out the lemons or even let them rot. What you do with life’s lemons is a reflection of how you handle life’s challenges. You always have a choice when it comes to what to do with your lemons. Below are some of our favorite lemon solutions! The acid in lemons help to clear bacteria, the natural enzymes help to exfoliate the skin, and the vitamin C will lighten the skin, aiding to even out skin tone and clear hyperpigmentation. There is lots of ways to apply, I recommend just squeezing some lemon juice on a cotton ball, apply to your skin, wait 5-10 minutes, rinse and moisturize. You can feel it working, I promise. Wash the lemons in hot water before you start. Remove the peel with a vegetable peeler, removing all white pith on the back of the peel by scraping with a knife, and put the peels in a 4-quart Mason jar. Add 1 bottle of vodka and stir. Cover the jar, date it, and put it to rest in a dark cabinet at room temperature. After 40 days, take out the vodka-lemon mixture. In a saucepan set over high heat, stir the sugar and water together and boil for 5 minutes. Let the sugar syrup cool completely in the pan, about 10 minutes. 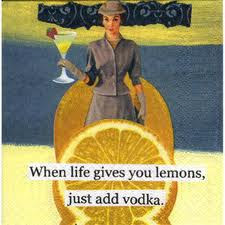 Add the sugar syrup to the vodka-lemon mixture along with the second bottle of vodka. Stir well to combine. Replace the cover on the jar and note the finish date. Return it to the dark cabinet and store for 40 more days. 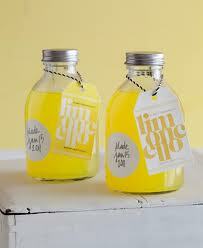 At Day 80, remove the limoncello from the cabinet. Strain the mixture and discard the lemon peel. Pour into clean, unused bottles with caps or decorative corked bottles. Store the bottles in the pantry, but put one bottle at a time in the freezer until ready. Makes approximately 3 quarts. It can also make a great gift. Makes approximately 10 8-ounce servings.